Hi! Welcome to 'Every Day English Dialogues'. In order to facilitate the majority of my International clients who need to learn English at a more speedy pace, I will record an 'every day' English tutorial. The tutorials will nicely accommodate, as well as become 'the missing link', regarding the intrinsic labyrinth of exasperations experienced while learning English. Within these podcasts I will be pointing out 'problem words', 'English idioms', and 'obscure English phrases'. These are common errors that seem to get lost in translation during most English lessons, and usually cause unwanted frustrations with the English language in general. 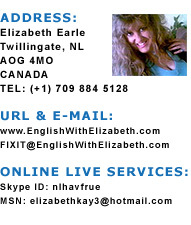 Of course every tutorial I upload to www.englishwithelizabeth.com is sure to be helpful and useful to all my clients. However, I predict these podcasts will be particularly helpful to my clients that already have a basic understanding of English, but are ready for the next step in their quest to familiarize themselves with every form of English language usage. Today's dialogue will explain the term 'Who Rules the Roost'. This is a widely used English phrase which signifies who is head of the household and master of the family unit. Basically it is the family member who is in charge of all domestic decisions made within the familiar home. For example, if two people were having a conversation, a chat or talking on the phone, one of the topics might be trouble within the family. This topic is especially typical of most friends sharing the daily stresses of their family life. More often than not, it is usually discussed among females. One friend may comment to the other, after a little prompting, "Well Jane, it's clear to me who rules the roost in your household! What the friend is saying is that she knows who has the most influence and control in Jane's house. A roost...ROOST..is also a place where birds sleep at night. Whether it be wild birds or domesticated chickens in a barnyard, they all sleep in a 'ROOST'. In turn, it's because of this that humans sometimes refer to their own houses as 'ROOSTS'. In order to 'Rule the Roost' one family member is said to be dominating over the others. Sometimes it's the woman ruling the roost, but it can also be the man. A child or sibling may also be accused of 'Ruling the Roost'. To be told someone in your family is 'Ruling the Roost' is not a compliment to your family unit. Actually it is said in a helpful manner, to the family member who is being ruled by a more strenuous spouse within the household. Often times problems and difficulties will arise if some sort of middle ground is not arrived at, regarding the running of the household. Middle ground means safe turf, equal opportunity, shared rules and a balancing of give and take by both family members. So, in closing, to Rule the Roost means to be the boss. It is a ruler within the family home that allows no other opinions or suggestions to be made by any of the other family members. If someone is said to Rule the Roost, there will no doubt be a number of bullying tactics put to use each and every day, in order for the Ruler to maintain the control of his Roost. That concludes today's tutorial pertaining to Who Rules The Roost. Today's tutorial will explore the common English phrase 'Meet and Greet'. Meet - MEET - means to encounter somebody, to make their acquaintance, to get to know them. Meet - MEET - sounds exactly the same as Meat - MEAT - but means something completely different. Meat - MEAT - is the flesh of an animal we kill in order to eat it. There are lots of occasions where a 'MEET AND GREET' function may be advertised. In essence, it's usually a public get together designed to allow strangers to get to know one another. More often than not a Meet and Greet will be organized with a specific theme in mind, permitting people who share the same likes or dislikes, to come together for a discussion. Greet - GREET - means to acknowledge another person in a friendly, relaxed manner. When you 'greet' someone, it lets them know you are cordial, polite and interested in talking with them. On the other hand sometimes it's possible to 'greet' another person with a cool, unfriendly and stand-offish attitude. In this case you would be described as 'greeting someone with a scowl or a frown'. It is still a greeting per se, but not the sort that actually personifies what the word Greet means. At a Meet and Greet party you know beforehand just exactly what you are going to do there, and prepare for it. You KNOW you will be meeting other people whom you've never seen or met before, and usually everyone strives to put forth a good first impression. Normally a Meet and Greet will not be a long evening, but rather much shorter so as not to stress everyone during first time encounters. They are pleasant affairs which encourage everyone to be social and in touch with others. That concludes today's tutorial pertaining to Meet and Greet.